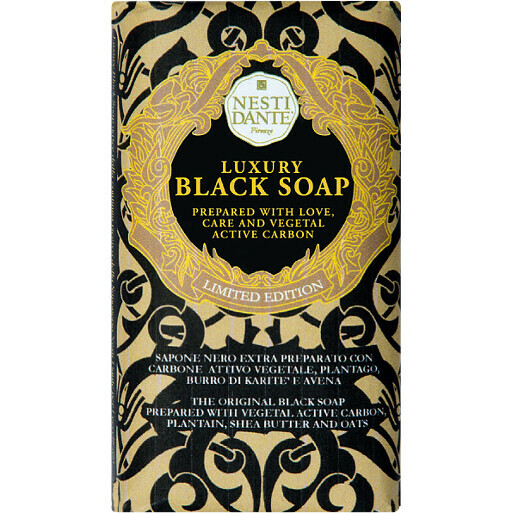 Indulge in a truly lavish cleansing experience with the Nesti Dante Luxury Black Soap, a limited edition triple milled bar for the body. Created with love and care as part of Nesti Dante’s continuous search for cleansing excellence, this sleek black bar is destined to add a touch of luxury to your bathing ritual. Its pampering formula is made from the ash of African plants including oats, plantain and cocoa pods improve circulation and enhance skin cell renewal. Added shea butter provides moisture for a truly soft and smooth result. The unique black soap is created from a secret recipe handed down through generations and is infused with mesmerising facets of spicy patchouli, pink pepper, fresh hyacinth and seductive notes of jasmine. Nesti Dante Luxury Black Soap 250g is rated 5.0 out of 5 by 3. Rated 5 out of 5 by Ostiglia from Great soap. I am a soap addict and I just love Nesti Dante soaps. I have already quite a few and the black soap is my latest addition. The scent is very pleasant and it leaves the skin soft and clean. The price is quite good when compared to similar products ,if not one of the cheapest.